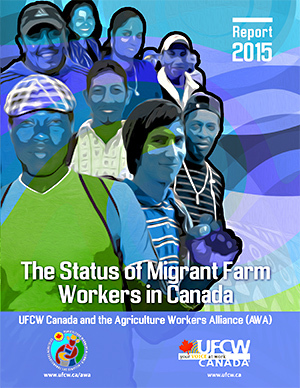 Toronto – October 27, 2015 – A new report from UFCW Canada and the Agriculture Workers Alliance reveals how many of Canada’s more than 45,000 migrant and temporary agriculture workers regularly face workplace and human rights abuse. The Status of Migrant Farm Workers in Canada 2015, details how this mostly invisible workforce, hidden away in agriculture centres across Canada, is left vulnerable to exploitation because of legislative and regulatory discrimination that denies migrant agriculture workers basic workplace, labour, and health and safety rights that most other workers take for granted. “While agriculture has evolved into a large scale, industrial enterprise, those who do the backbreaking work are essentially powerless in the face of a system that often treats agriculture workers more like disposable commodities than human beings,” says Paul Meinema, the national president of UFCW Canada. For more than three decades, UFCW Canada has been the leading advocate for the labour and human rights of migrant and temporary agriculture workers in Canada. In association with the Agriculture Workers Alliance (AWA), UFCW Canada operates migrant agriculture worker support centres in agriculture centres across Canada. Over the past decade, the centres’ staff have documented the concerns of thousands of migrant agriculture workers regarding unpaid work time, hazardous working and living conditions, and arbitrary repatriation. Currently, in Ontario – the province with the largest agriculture workforce – workers in the sector are excluded from unionizing under the Ontario Labour Relations Act. In most jurisdictions across the country, migrant agriculture workers are also restricted from the fullest protection of provincial employment standards and health and safety regulations. As the new report details, the result is that Canada’s migrant agriculture workers are faced with conditions where exploitation and abuse are all too common. Migrant and temporary agriculture worker programs in Canada are regulated by the federal government, and typically tie a worker to one employer with no option to seek another if there is a workplace problem. Providing transferable work permits is just one of the report’s 19 recommended legal reforms to provide fair treatment of migrant agriculture workers. Some of the other recommendations include an impartial worker appeal process when faced with arbitrary repatriation, national standards to monitor and discipline offshore recruiters, mandatory dormitory health and safety inspections, as well as revising discriminatory legislation where it exists to provide agriculture workers the same rights as other workers to join a union and bargain collectively.